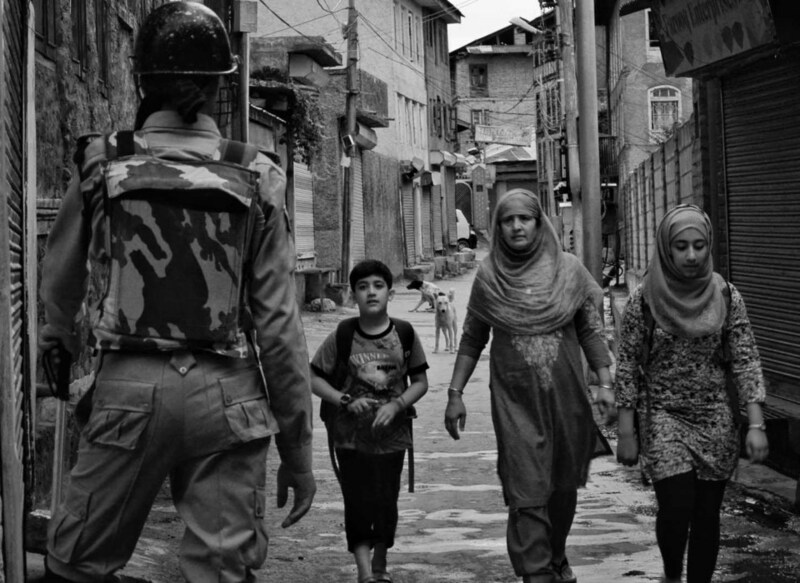 The memoir is the sixth in the series from Wande special issue on Kashmiri women titled Me and Militarization. They say, “There are no seven wonders of the world in the eyes of the child. There are seven million.” There indeed are millions of images in those eyes. For me, there are hundreds of AK-47s, millions of bullets, millions of canons, millions of pellets, tear gas, pepper gas and chilly sprays, unimaginable numbers of dead bodies, thousands of unmarked graves and unknown graveyards. Being born in a place full of turmoil and asked to count your childhood memories would offer you no more than curfews, crackdowns and the raging gun fires with those deafening sounds. These memories take you back to your fear, your helplessness and your sadness under the grim shadows of those Kalashnikov rifles. I am a regular student but what makes my experiences unique is that I was born in a place about which they say, “Agar Firdous Ber Roye Zameen Ast, Humi Asto Humi Asto Humi Ast” (If there is paradise; it’s here, it’s here, it’s here). I belong to a place called Kashmir where every season is a reason to live, where beauty is found everywhere, where every dawn is melodious and every dusk is mesmerizing. However, this is not all there is to it. The place is full of ironies. Being born in a place like Kashmir and having grown in the nineties, I have another name: “Conflict Child”. I am not alone; the other children born in Kashmir in the nineties are also the conflict children. This constitutes our rare experience. They say, "Time heals all the wounds". But I disagree. I believe that though everyone seems to move on, those memories continue to haunt us and send a shiver down our spine. It is just that we learn to get accustomed to living with the scars and the pain. It soon becomes an inseparable part of your life. I vividly remember my childhood and growing up experiences. I did not know what exactly the army was for but I somehow seemed to know what they did. Their presence and their appearance was something distinguishable. I remember as a kid, when there would be crackdowns and the army would enter my home with those huge and dangerous guns, I would wrap a thick blanket around myself and lock myself up in a cupboard. I believed to think they had come to take me away from my family to a faraway land where I’d forever be alone (a punishment for my mischiefs). I had heard the sound of their bullets, seen them beating people mercilessly, heard elders talking of how they’d set fire to the houses, heard them killing with their guns. All this stayed with me. I learnt it and understood it. I am the first child of my parents. They sent me to school when I was three years old and thus began my rare journey of schooling. As time wore on, I learnt very special words like ‘curfew’, which meant that one was not supposed to move outside one’s house until the time it was lifted. Another word which entered my vocabulary was ‘crackdown’, which meant a search operation conducted by the army when all male members of the family were supposed to move out of their houses, assemble at a place and all the female members were supposed to stay inside their homes, while searches were on. Similarly, ‘hartal’ meant transport would not ply on roads and among other things, schools would be shut and was thus a holiday. My grandma used to dress me up for school and my grandpa would check whether transport was plying or not. If it was plying it meant it was a school day and if not then it would mean ‘a yippee’ – a holiday. On many nights I used to pray to Allah for hartal the next day so that I could enjoy a holiday. I thought that Allah listened to my prayers. This went on until I understood that it was not something normal or something over which I should be happy. Neither was it because I was praying and Allah was listening but it was because of some conflict which till date has not been resolved and that is popularly known as the Kashmir Conflict. Every Kashmiri suffers because of this conflict – in one way or the other. Students like myself have suffered mentally, physically and educationally. I remember when huge civilian unrest broke out in Kashmir in 2008 over the Amarnath Land Transfer, leaving hundreds dead and thousands injured. We did not go to school for nearly three months as curfew was imposed. After all, this ended, things seemed to return to ‘normal’ for some time but in 2010 another period of turmoil and civilian unrest befell Kashmir. This too left hundreds dead and thousands injured. We didn't go to school again this year and our exams got cancelled. This time there were no classes because the curfew stretched for five long months. In 2016, the civilian struggle to end the endless violation of human rights seemed to have reached its peak. People were killed, beaten, maimed and blinded mercilessly by those who have power. The curfews and the shut-downs extended for a period of over five to six months with internet and cellular services banned. There was no proper media coverage. Kashmir was cut off from the rest of the world. Neither did we know what was happening in the outside world nor people outside knew what was happening in Kashmir. The worst was the use of so-called non-lethal pellet guns (originally used to control animals), that left hundreds of young people visually impaired. Growing up in Kashmir and witnessing violence all my Iife, I pose a question. In this day and age, we talk and discuss animal rights, but what about human rights? And what about human rights of Kashmiris? Let’s say for instance, where else in the world are pellet guns used for crowd control? It seems that the rights of the people of Kashmir are less important or perhaps the “rights” don’t exist for us. Alas, this beautiful and famous place, plagued with tragedies and misfortunes continues to be a big game of chess for the governments on the two sides of the borders where everyone is busy making their moves and the innocents suffer for no reason at all. As I pen down these lines, a famous dialogue from the movie Haider resonates in my mind which perfectly summarizes the fact that the sufferers of the Kashmir conflict are the common people of Kashmir. Uzdah Jawaid is a student at Jadavpur University, Kolkata, West Bengal. She hails from downtown, Srinagar.